Shine the highest quality tanning bed lights on your customers. 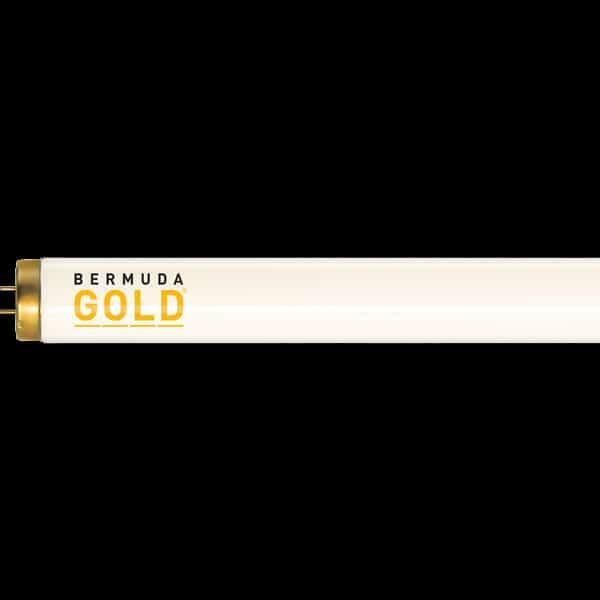 The Bermuda Gold Premium FR71 160W Replacement Tanning Bulb is different from the other Bermuda Gold tanning bulbs because it comes with reflectors, high wattage, and a mid-level UVB grading. All of these elements work together to create a high-performance bulb that delivers the best tan when used in 20 minute increments. The tanning lamp reflectors and high level of wattage ensure that each tan will deliver a certain amount of intensity. The UVB rating is neither high nor low. That means that it will not take ages to achieve a deep, dark bronze, but it won't be instantaneous, either. Instantaneous tanning results oftentimes mean reddening. This is a high-power style of tanning light that keeps the health of your skin in consideration. For questions on tanning bed bulbs or to find replacement bulbs for other brands of tanning beds, please feel free to contact us. Please to make sure you are ordering the correct size bulbs. We also carry a full line of a variety of popular bulbs such as Bermuda Gold, VHP, Phillips, Cosmedico, Light Sources, Interlectric and Voltarc. This item ships via UPS / Fed Ex. Most delivery times within the Continental U.S range from 2-5 days depending on location. All tanning bed bulb orders received before noon will ship that SAME DAY.